See for details this chapter. The port must differ from the client service port to avoid conflicts. Use this service if a faster clock is wanted and/or all clients must be synchronized. This is the start time for the clock service. The computer time is used if the values are set to 24:60. Note: The clock will no longer be in sync with the hardware computer clock. This is the port at which Rocview clients must connect to become all data and events needed to function. Default 10 clients are allowed to connect concurrently to the Rocrail server. Prevent secondary clients controlling the Rocrail server; only the first one connected has control. A better solution is the use of Control or Slave Code. The client must provide this control code to get write access if set. This overrules the "Only first can control" option. Leave blank for normal use. Optional service for SRCP Clients like J-Man or spdrs60. The objects addressed by those clients must be defined in the Rocrail track plan. Optional serial device to service SRCP. Activates the SNMP v1/2c Agent in the Rocrail server. iso.3.6.1.2.1.1.1.0 = STRING: "Rocrail 2.0.2508 Sunrise"
The location of the @Box. 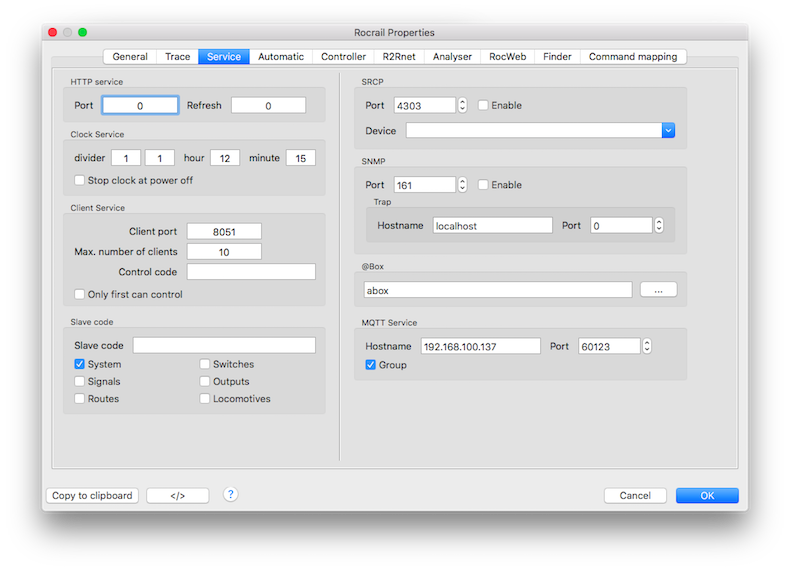 Clients can use the MQTT Broker to communicate with the Rocrail Server. rocrail/service/info All server broadcasts are published with this topic name. rocrail/service/client Clients can publish commands with this topic. rocrail/service/field Clients can publish hardware events with this topic. rocrail/service/command Command station commands for User Libraries. The payload of the MQTT messages are in RCP Format. The Rocrail Server uses the MQTT V3.1 Protocol. The DNS name or TCPIP address of the MQTT Broker. The service port number of the MQTT Broker. The default port number used by Mosquitto is 1883. Use the Item Names in the Broadcast Topic. With both topics, field and command, it is possible to implement a user defined CS library without Rocrail Source dependencies. Only Quality of Service 1 is supported. Clients may use QoS 0, but we strongly recommend QoS 1. 1467710159: New connection from 127.0.0.1. 1467710159: New client connected from 127.0.0.1 as mosq_pub_2323_rob-Virt. An UDP Multicast discovery service is also available for other devices which wants to use the same broker.